The normal well balanced person determines to learn from a failure, to profit by experience, to act more wisely next time. – Dr. Eustace Chesser. We cannot give to the hyena twice – Tūtingīhe hiti keerī. A long time ago in the land of the Gīkūyū people before the coming of the tree frogs, ciengere, it was normal to dispose of the dead by leaving the dead body in the forest for the hyenas to feed upon. Even today, vultures and hyenas still perform this cleaning up process in the wild and thus recycle back into the ecosystem all the minerals and substances carried by the body. If a man in Gīkūyū society committed a heinous crime like murder that required the death penalty to be passed upon him by the Council, Kīama, the usual sentence was for the criminal to be put inside a beehive, (hollowed out log) and rolled down a hill where he crashed down to his death. Kūgaragario na mwatū. Since the murder victim had been eaten by hyenas, more often than not the Kīama commuted the death sentence by arguing, “Oh! Why give this man to the hyenas too? Let us not give to the hyena twice. Tūtikūhe hiti keerī” the reasoning was that the Council held itself partly responsible for not having resolved the matter before it escalated into murder. The Kīama feared that the community’s collective guilt would not be atoned by merely committing another man to the hyenas. The man was allowed to go into exile leaving the community to heal from the tragedy. The major bone of contention then, and the root cause of so much bloodshed has been traced by historians to the Africa land grab or scramble for Africa by the European powers that resulted in the famous Partition of Africa between the European powers in 1885. Kenya happened to fall under the British “Sphere of Influence” and the subsequent British settlement saw the alienation of land from the Africans. It just happened that the major part of the alienated, grabbed lands were the fertile Highlands that also happened to be mainly Kikuyu land. Versions of the history of this struggle are taught in Kenyan schools and are also available online and in libraries and it’s not necessary to repeat any here. Suffice to say that it would be unfortunate were we to break the oath of our forefathers and give to the hyena twice. Today, the second scramble for Africa, the second land grab in Africa is under way. According to “Stop Africa Land Grab”, “The African people face an existential threat. With the enthusiastic support of some African governments, foreign countries and wealthy foreigners are rapidly taking over the productive lands in Africa and turning Africans into refugees and slave labourers in their own homeland”. According to the website, what is unfolding in Africa is a tragedy of epic proportions. Clothed in the garb of “Food Security in Africa” these massive land grabs by foreign multinational corporations are into production of bio fuels, palm oil, flowers, sugar cane, pine apples, etc. etc. not for consumption by Africans but for repatriation to China, Quatal, France, Saudi Arabia to mention a few. (see map below) This in exchange for mainly mechanical and electronic toys that fascinate the modern African bourgeoisie. 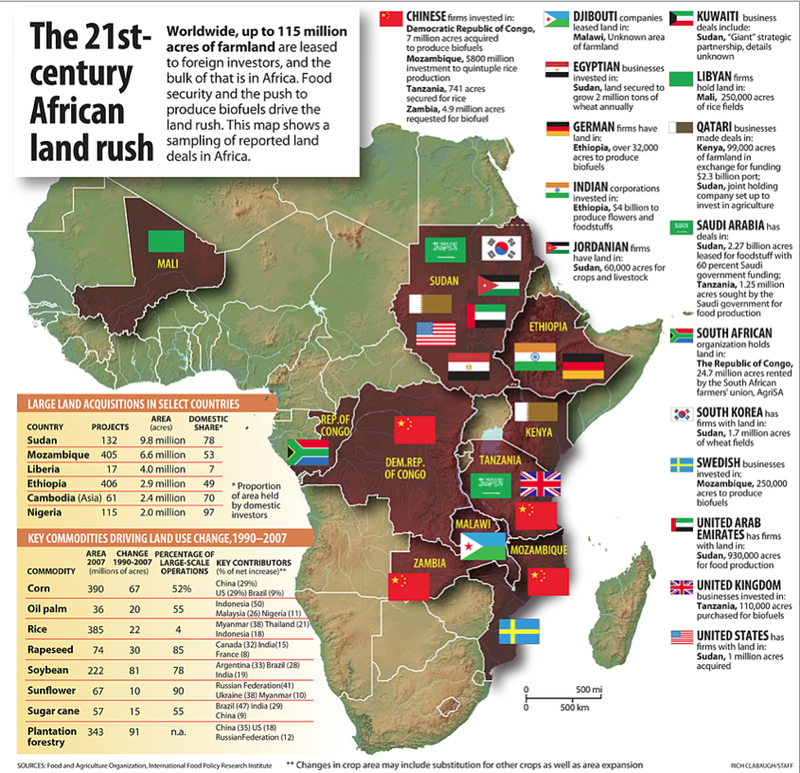 The scale of the land deals has prompted some to comment, “It is a mad scramble for Africa farmland right now” and again just as in 1885, the argument is that the land is “unoccupied”, and “underdeveloped”. Are we going to give to the hyena twice? Nī tūkūhe hiti keeri? Writing about Twiga Farm in Kiambu, Central Kenya as a case study of a Kenyan land grab, Leira Von Rinsum, a freelance journalist concluded, “In global neo-liberal framework that demands pro-corporation, pro-profit development led by investments, they (Twiga Farm) are only one example of the massive land grabs and evictions taking place in Kenya and in Africa. The collusion of local, national and international money is more and more regalizing the disowning of people of their lands in the name of economic growth, development and investment. It is a powerful partnership to stand up against” So very powerful as is clearly evident in the unfolding tragic drama in the Rift valley and Northern Kenya. It is a mad scramble even by locals to monetize every little piece of ground as the pestilential fever spreads. DW reports that it is now certain that land grabbing in Africa is fuelling conflict. In Ethiopia, it is reported that hundreds and thousands of farmers and settled communities have been uprooted with many of them ending up homeless wretches in rural towns, villages and urban centres. In the Omo valley, home to some of the most ancient and rich African heritage, the displacement of thousands of these indigenous peoples has greatly elevated the potential for violent clashes. In Sierra Leone, resistance to corporate land grabbing by palm oil companies has led to violent clashes between government forces and protesters. Is the rise of violent conflict and loss of life inevitable? Already too many lives have been lost and many more destroyed by this Africa Land Grab 2.0, so is the rise of Mau-Mau Reloaded inevitable? Are we not ALREADY giving to the hyena twice? Andū aitū! Kaī tūngīhee hiti keerī? It’s a shame that most of our leaders see this as a cover tool to signify economic growth yet it’s for their own selfish gain leaving the local mwananchi to suffer with loss to everything even his little shamba that his great grandfather left him. Currently Chinese are walking aimlessly at my rural place not that its a bad thing to have visitors but sooner or later locals will state selling to them their pieces of land for this bourgeoisie that we are so obsessed with and have nowhere to settle.